Woodside’s Little Bush Playground will be getting a $3 million revamp in a project that includes re-imagined play areas, gathering spaces and new fixtures at the small park. 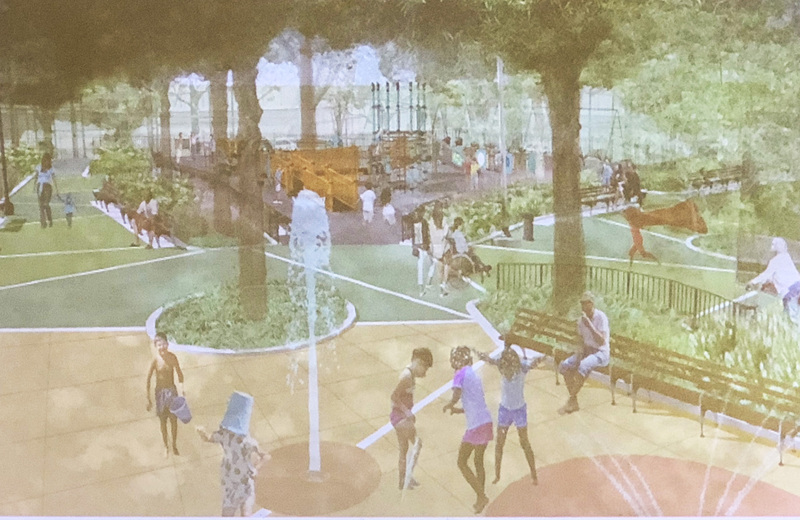 NYC Parks presented their proposed plans to Community Board 2’s Land Use Committee on Tuesday, noting that the less-than-an-acre park at Laurel Hill Boulevard and 63rd Street, and companion to Big Bush Park located across the tangle of highways, hasn’t seen significant work done to it since the late 1990s. The agency said the revamp is aimed at bringing new, creative play areas for children of all ages and abilities, improving seating and gathering spaces for families and caregivers and improving the park’s overall circulation and layout. 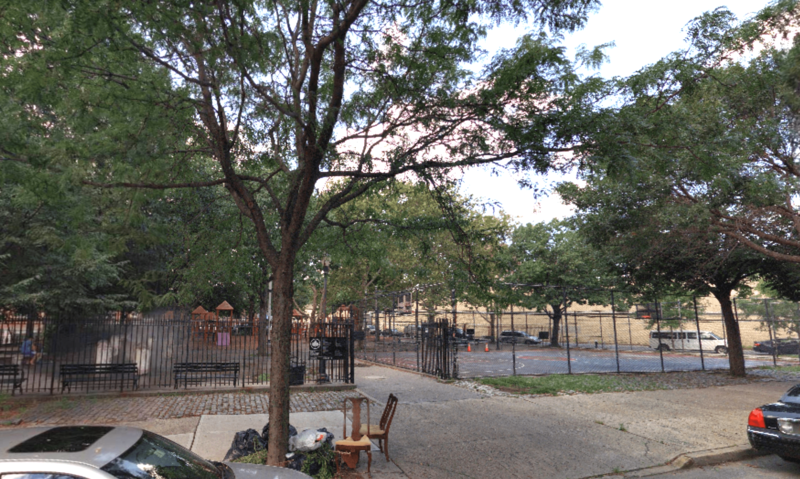 In the updated play area, the swings will be relocated along the Laurell Hill Boulevard side of the park from its current siting along 63rd Street. Along with bucket and strap swings, a new wheelchair accessible swing will be installed. Play areas designed for kids in two age groups will go south of the swings. The currently slide and play houses will be replaced with an expanded, improved and accessible play unit for children ages 5 to 12. A new slide will be included, along with a netted, spiral climbing structure. Next to the new play structure will be a smaller area where kids between 2 and 5 years can interact with age-appropriate equipment. Over in the spray shower area on the southeast end of the park, the camel sprinklers will be done away with and replaced by new ground sprays that will be programmed to release water either in three modes. The Parks department said it is doing away with above-ground sprinkler structures in its revamp in response to community requests to try to open up the park space. The new sprinkler layout, they say, will allow people to walk through the area when the sprinklers aren’t in use. The park will also get a major splash of color. The current asphalt paving throughout the park will be covered with a green sealcoat, with the concrete in the upgraded spray area to be colored in yellow. 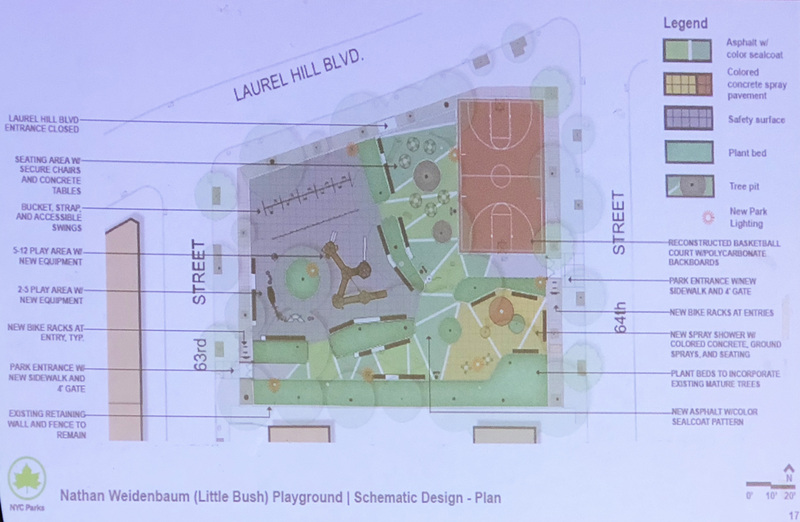 The basketball court at the corner of 64th Street and Laurel Hill Boulevard will also be reconstructed with polycarbonate backboards and a new brown floor surface area.The tall fence separating the court from the rest of the park, meanwhile, will be removed to create a sense of more open space. The seating area immediately adjacent to the basketball court will also be outfitted with secured chairs and concrete tables. NYC Parks is also proposing to install three bicycle racks at the park’s two entrances, where there are currently none, and to lower some of the fencing height around the park to create a more opening environment. The park’s lighting structures throughout will be updated with brighter and stronger LED lights, and the park’s pitted areas will be planted with perennials and shrubs. The proposed changes received much praise from the committee, which agreed to submit a letter to the department in support of the project plans. The park’s design process began in April of this year, and is expected to be finalized in early 2019. From there, contractors will be hired to carry out the job in a process that typically takes nine months. Construction will start after that, and could take over a year to complete. They’ve ought to do something about those weird adults who come and play basketball with those young high school kids. Creep me out. I hear it’s getting a trim around the edges and a landing strip too. Well that was dumb. They just closed the park for over a year to redesign the park by apt building now they are relocating swings? !